Picked up a jack in the box stand sometime back . It’s dirty grimey and has some surface rust . Has several coats of paint on it . Top coat is red under that is a brown and it looks like original paint was a dark blue . Can anyone verify the original color on these stands ? Were they ordered from the factory in different colors ? Or did they come from the factory in just one color ? Did different companies make these ? This one may be a Mills . I say that because of the worm cut lock and key that locks the box . I have a dual slot safe stand that was factory painted in wrinkle coat . I see no evidence of a wrinkle coat paint job on the jack in the box stand. Mills stands came either dark blue or black. I do not know of any special order colors but would not say they are none. There are always some new stuff surfacing. Watling and Pace made stands also, but it seams Jennings used only fold up stands. Watling stands usually have a tapered top and a diamond emblem on the belly. Pace is similar to Mills you just have to know the differences. I knew someone would have the answer . Thanks ! So this is probably a Mills stand as it does appear the original color is dark blue . As for Jennings not sure if they did a jack in the box stand but they did make a metal stand or had them made . Heres a pic from Bueschels book on Jennings slots . If anyone has one of these Jennings stands for sale contact me I’d like to buy it . sam2002 wrote: I have a dual slot safe stand that was factory painted in wrinkle coat . I see no evidence of a wrinkle coat paint job on the jack in the box stand. I don't know when the stands were first introduced, but from what I can tell Mills started using wrinkle coat paint on slots in the late 1930s, and went to chrome plating and regular paint after that, so wrinkle paint may date to a particular era, but regular paint may still be original on earlier or later production. 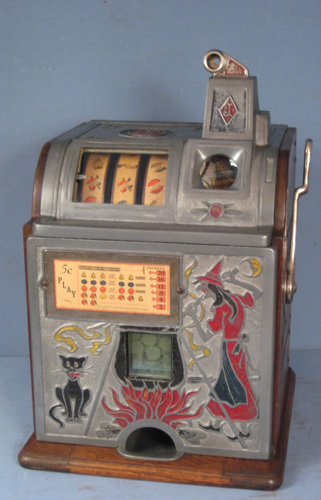 Something I had seen lead me to assume that Mills, or at least some of the other slot machine companies, bought jack-in-the-box stands from an outside manufacturer, and just re-branded them. Hopefully someone can lay out the details. Old pictures indicate that there were once a lot of stands in use, but they seem to have become scarce. I'm still looking for a folding stand for a QT, by the way. Thanks for posting this ! Great information on the jack n the box stand . Black wrinkle it is !